Does America need a time-out? 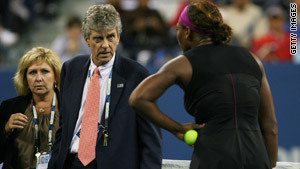 Serena Williams faced a $10,000 fine for her profane tirade against a U.S. Open at a lineswoman. (OPRAH.com) -- Rudeness isn't contagious -- but we all may be carrying the virus. Has rudeness become a chronic condition? I was in the Amtrak Quiet Car last weekend. The "Quiet Car," as the conductor pithily put it, means, "No cell phones, no fun!" Twenty minutes into our blissfully silent journey, this woman behind me makes a call. She was speaking in French, and I sort of wanted to use her transgression as a way to test what's left of my French skills. But the most primal part of me wanted to grab her phone, just as Kanye West snatched Taylor Swift's mic; I wanted to threaten to shove it down her throat, just as Serena Williams threatened the line judge with a tennis ball; and I wanted to yell j'accuse! in the same Southern cadence of Joe Wilson's bug-eyed, "You lie!" Not exaaaactly. I'd say our capacity for incivility is the same as ever, but what is on the rise is our ability to express and bear witness to rudeness. I'm not the first to point out that Twitter, Facebook, YouTube, talk radio -- all of these give us ways to behave rudely with immediacy, scope and, often, anonymity. We have more means at our fingertips to react without delay: We can tweet, text, phone or e-mail our nastiness, unfiltered. Our outlets for rudeness are on the rise, but so is our consciousness of it -- and that's not a bad thing. Oprah.com: Is there such thing as too much communication? But I think if our best answer to rudeness is self-righteousness, we're missing something. That question -- "is rudeness on the rise?" -- implicitly suggests that we might be in the throes of an epidemic, that rudeness is contagious. Such a diagnosis implies we're not rude until we "catch" rudeness from someone else. You can't help catching a cold right? And if someone's rude to you, you can't help being rude back, right? Wrong. This notion of contagious rudeness absolves us of responsibility. I think of it more as a latent virus we all carry. Gross, I know, but helpful...and hopeful. You know how when you feel stressed, or run-down, or Bart in HR forgets to sneeze into his elbow, you "happen" to get sick -- because you're in an environment that activates a virus? I think it's the same with rudeness: It's this little beast inside us that just trolls about, waiting for its opportunity. And when someone is rude to us, that beastie lunges out of us -- if we let it. Like any kind of chronic condition, we have to stay on top of it. If only there were a rudeness alert system so we could be prepared. You know, like the UV Index or the Air Quality Alert -- Al Roker could tell you, "There's a cold effrontery hitting your neck of the woods!" Alas, we have stay on top of our own latent rudeness. If we own it, watch it, then we can take some spiritual vitamin C to keep it dormant. We can carry with us emotional Purell so we're not at the mercy of others' bad behavior. Remember Quiet Car Lady? Well, a gentleman pointed to a sign that read "QUIET CAR. NO CELL PHONES." This was more productive than my passive-aggressive stare. Madame ended her call (something about Michel going to le plage and la plume de ma tante? I really have to bone up on my French...) and immediately said: "No cell phone? I'm sorry...I did not know." Pop! My self-righteous bubble burst. I was so glad I hadn't been ruder, more imperious. She was human; she was sorry. The other day, I was invited to visit a K--8 school in Harlem. Purell dispensers dotted the hallway walls. This school was taking precautions against getting sick. But a sign of even more robust health? Every single kid I passed stopped, introduced him or herself, and shook my hand. In their classrooms, they stood up before talking to me. Some seventh-grade boys in "Conflict Resolution" class explained to me how when they get upset, they check their "anger barometer." While this made me feel very, very old, it also filled me with hope. Seems like they're doing some hand and heart sanitizing. Faith Salie is a writer, actor, and humorist who contributes to O, The Oprah Magazine's ethics column. She is a television commentator and a former public radio host.